If you search the internet, you will probably see a big split on this but I always start with the ribbon. Something else you will see a lot too, is that more often than not, people tend to use the entire spool of ribbon as one long piece, wrapping and weaving until the ribbon is gone. If I cascade ribbon, I will use longer strips but 90% of the time, I use this method. Typically, my favorite type of ribbon is around 4″ wide with wired edges. 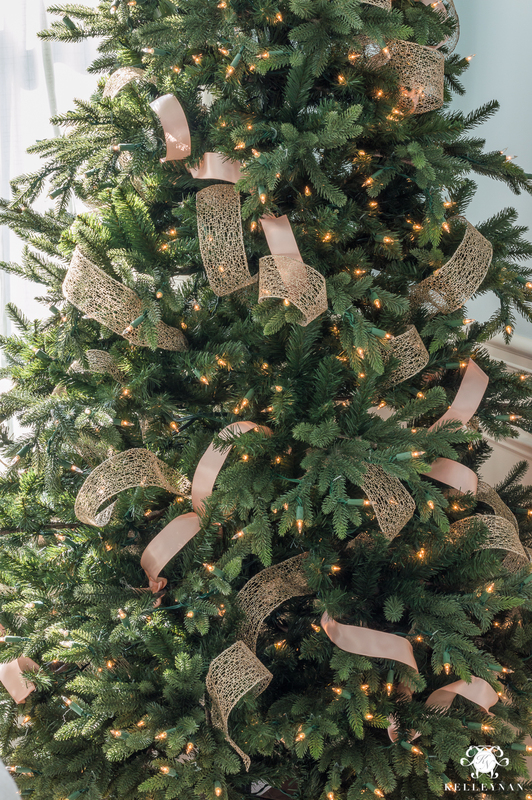 Ribbon that is “meshier” works the best for sticking to piney branches. My favorite place to look for my base ribbon (to start) is Costco. They have wide ribbon at 50 yards for $9.99. I then usually head to Michaels or Hobby Lobby for the rest. Also, in regards to how much? I don’t really have an answer. But, I use a ton. You can always purchase and take back what you don’t use. So, once you have your arsenal of ribbon, determine which ribbon you want to be most present. 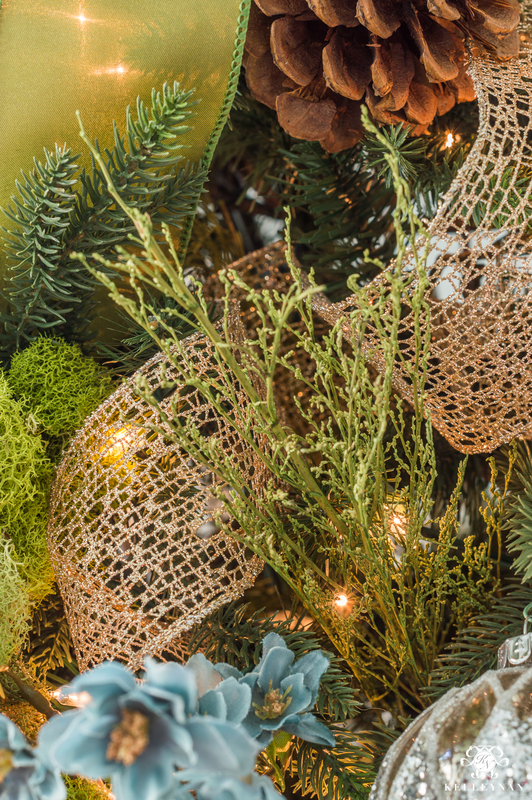 I used a 2.5″ mesh ribbon as my base on this tree. 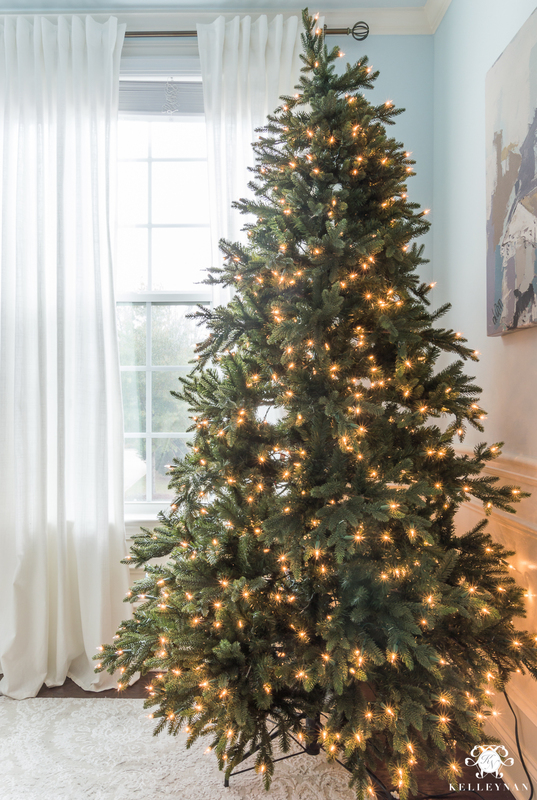 Cut strips that are around 3′ but don’t cut them all at once Depending on the size of your tufts and how deep you go in the tree, you may want to modify the size. 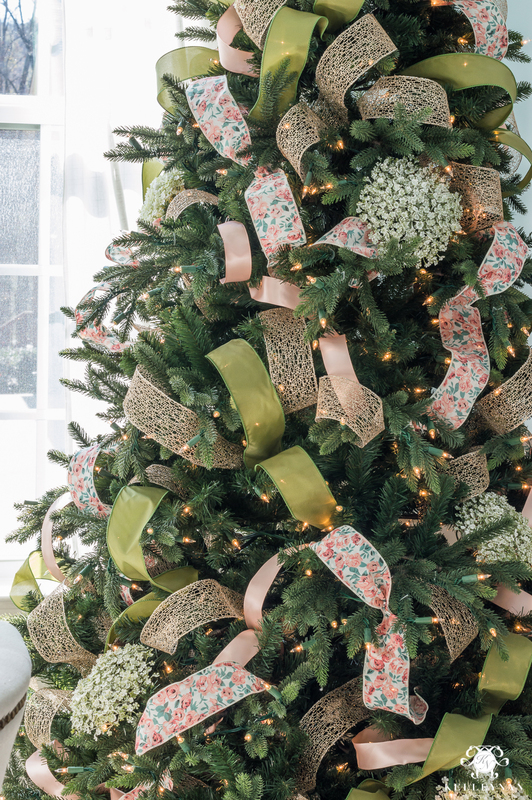 Keep in mind, using ribbon makes it easier to change the look of your tree each year. 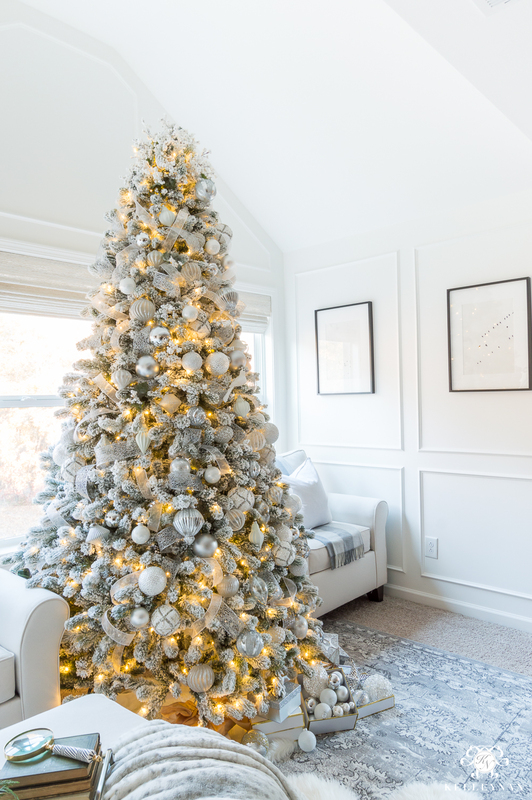 If you have a base of white/metallic ornaments, you can simply change your ribbon color and it changes the entire color scheme of the tree. Take the end of the ribbon (I usually start in the middle of the tree), and stick it in. 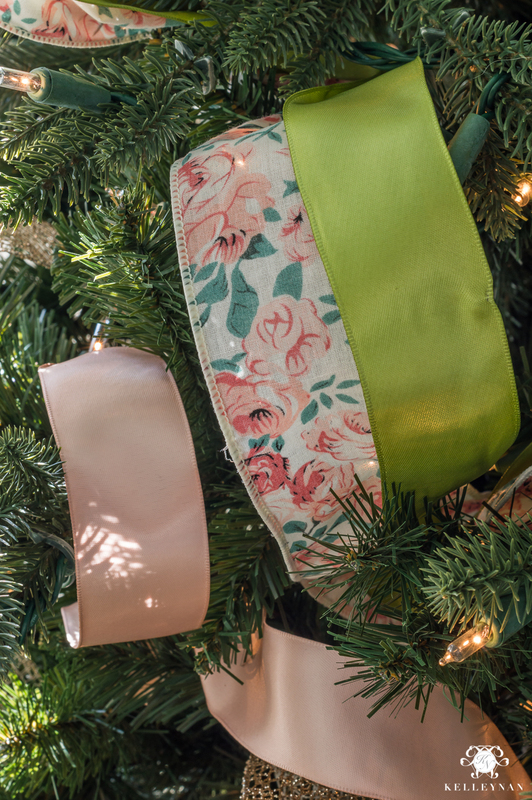 I use my hands to feel around inside the tree for a good spot for the ribbon to stick. If the outward branches seem to “support” the ribbon, you don’t have to worry as much about securing the inside end to an actual branch. Meshy ribbon will usually just stick to the inside needles while more satiny/smooth ribbon may be to be secured a little more by bending an inside branch to pinch the end. 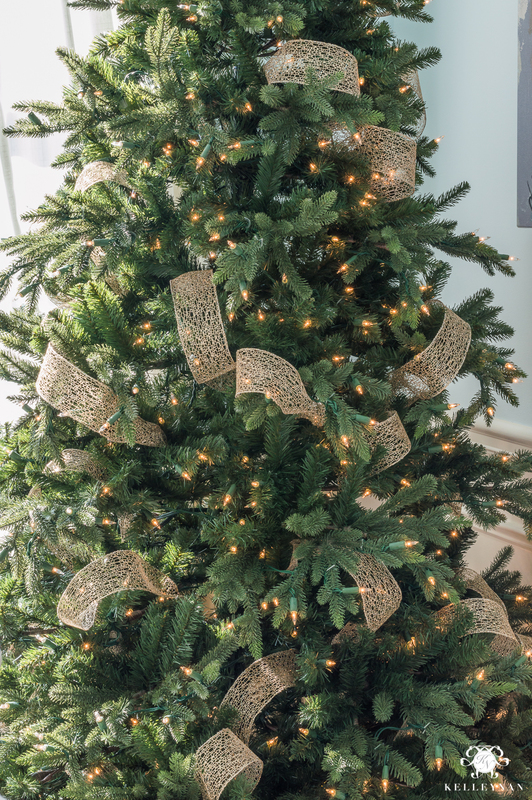 Once the tail is secured, billow the ribbon out, kind of at a diagonal and bring the center in to secure the middle of the ribbon inside the tree. This should form one billowed tuft. 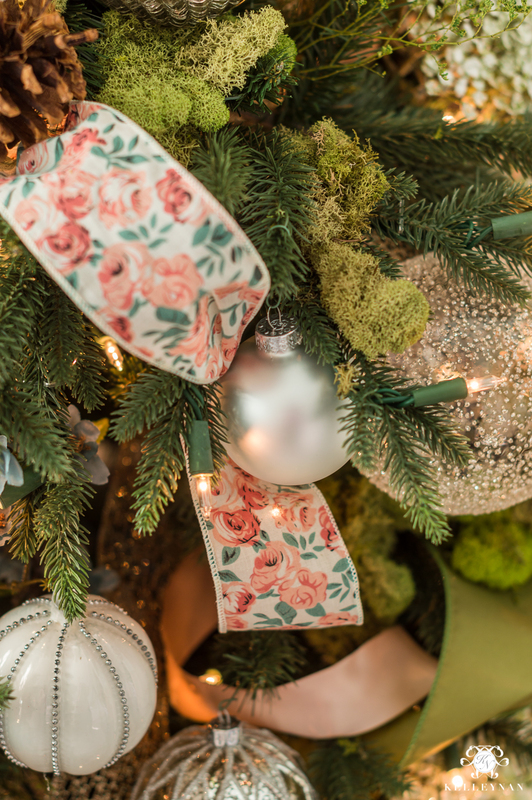 A few tips (this will make all the difference) – you don’t want the ribbon tuft to be pulled tight against the branches. You don’t want to see a taut wrinkle. When you are billowing, try to clear the outside branches into a big loop, but not so much that it sags. Also, when you are creating your loop, kind of push the ribbon upwards (as though you are almost pinching it back to the first secured end) instead of pulling it downwards. You can even turn it slightly sideways and have it “sit” on its side, on a branch. Once you have secured the middle, take the rest of the ribbon, come back out (depending on the branch position with determine whether you come right back out where you went in, or, whether you bring the tail out a little lower). You want to form one more tuft with the ribbon so repeat how you created the first and then secure the tail just as you secured the other end. Again, if the branches are supportive and the ribbon is meshy/sticky, the inside branches may grab it enough. 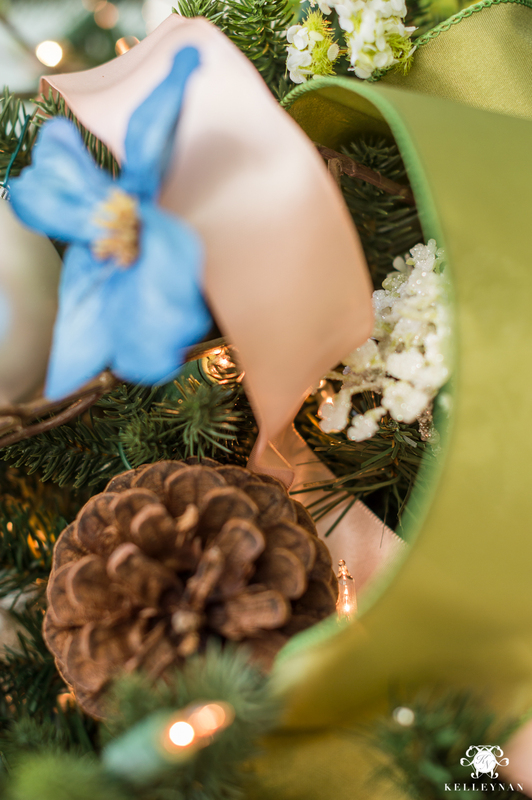 If not, you may need to slightly bend an inside branch to secure the ribbon. Two tufts from each 3′ strip is the goal. For the second piece, start at another place; I usually always go at a diagonal but mix up the direction. Here is what my first strips look like. You don’t want a huge loop with the second being tiny, but they don’t have to be exactly the same size. Repeat all over the tree and don’t neglect the top. Full admission, I try to get back around the sides of the tree but don’t worry about the back facing the wall. But, when you are fluffing, make sure you fluff the back so you don’t see through the tree. I will continue to do a little fluffing as I go along. Once I have a pretty consistent covering of the base Christmas tree ribbon, I will choose another to go in and accent. Don’t worry, if you decide you need more of the original ribbon when you finish, you can always add more! 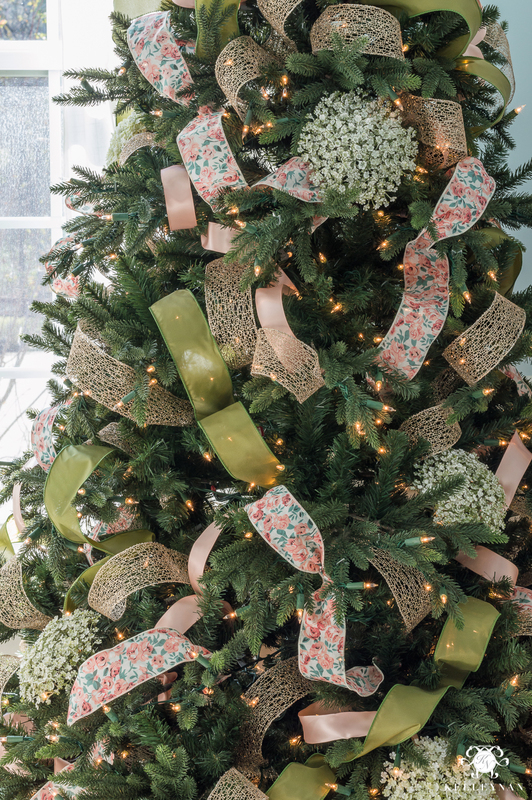 As a warning, this is kind of a difficult tree to show as my example because I did a few things out of order and used some ribbon I wouldn’t typically recommend. My second ribbon was a thinner, more satiny (but still wired) peach. You can see the wrinkles more easily and it’s more difficult to work with. As a rule of thumb, the wider the ribbon, the bigger your loops can be. Thinner ribbon can’t support itself as well and will need to have smaller loops. I still recommend going for two tufts per strip (this one I actually created three) so your strips may need to be a little shorter. Start with a test piece first before feeling out your ideal length. Repeat with all your ribbon colors and textures. One of my favorite things to do (which helps you with a thinner ribbon), is to layer two ribbons on top of each other and treat them as one strip. When they are in place, you can pull one to the side slightly to reveal the underneath. I started with a more vibrant green but ended up removing it – you’ll see why a little further down. If I have a more busy/patterned ribbon, I add that last and in smaller quantities. 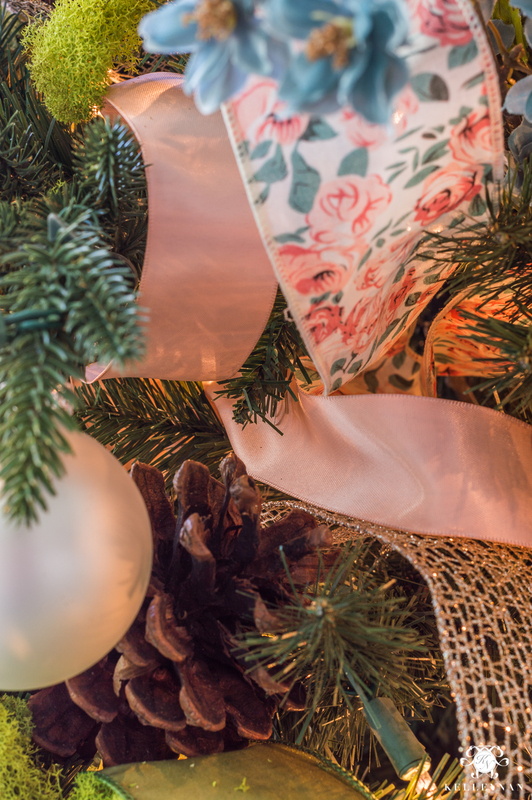 I like it to be a little more subtle and usually, the patterned ribbon is fabric, in the regular ribbon section, and is usually more expensive for just a few yards. The spools are usually much shorter too. I believe I used three spools of 4 yards each of the floral ribbon. You may notice that some of my floral fabric loops aren’t as deep. If you have to pinch it in between the surface branches, we can cover that up, too. Just try to go deeper where you can. Lastly, I added a thick green ribbon, surveyed the tree, and ultimately added a few more pieces of the original gold. Four types of ribbon total. By no means do you have to use four types, but at least two will keep things interesting. Admittedly, my next step is a little out of order from my typical process. As a general rule of thumb, after the ribbon is secured, I try to add the next largest series of items. Usually, this is where I will start hanging ornaments. 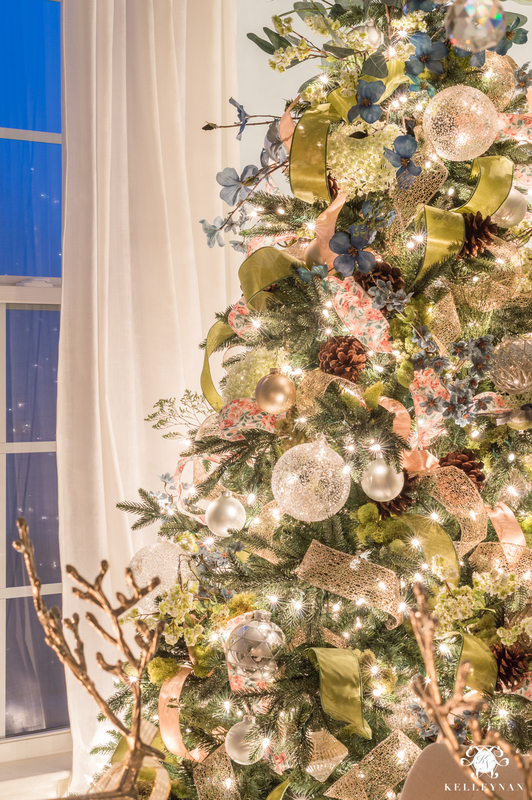 For this tree though, I had a few huge floral stems that I decided to incorporate first. Another tip- don’t feel like you are only allowed to select from the Christmas section/picks. I hit up the floral aisles to find coordinating stems. If the stem is too long, you can fold/cut it to be a bit shorter. I bury the big items and nestle them in the branches, closer to the tree base. I like to fill in open spaces but also, don’t be scared to cover a little ribbon. You may need to adjust some ribbon tufts as you incorporate your big pieces. You can also use a couple different techniques; I use both in this tree. You can cluster a few like items together for an impact (think three red balls together all over), or, spread everything out evenly. I spread the snowball blooms out evenly. I said this was a unique tree, right? 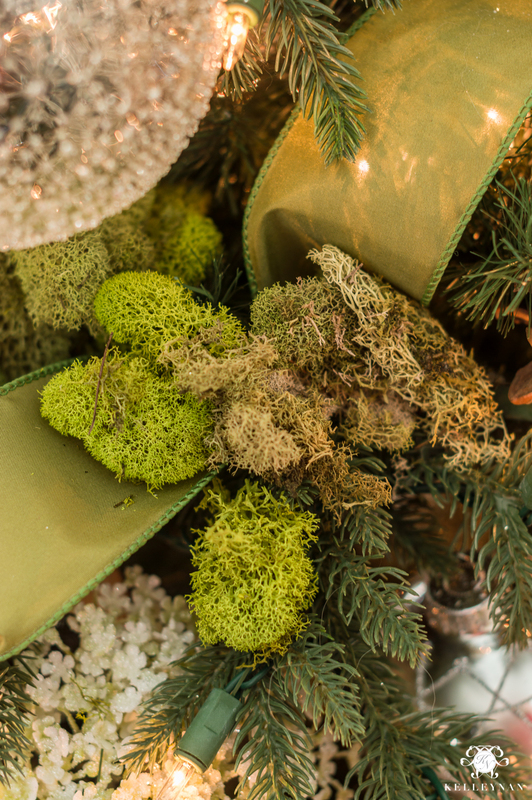 My next step was to add some moss on the branches for my Christmas meadow tree. Some, I molded to branches, and some, I covered more shallow ribbon loops. I have never used moss in a tree before and I don’t think there’s many themes that I would necessarily, but for this specific tree, I loved the result. Before the statement up top, I actually stuck in other branches since they were on the larger side. 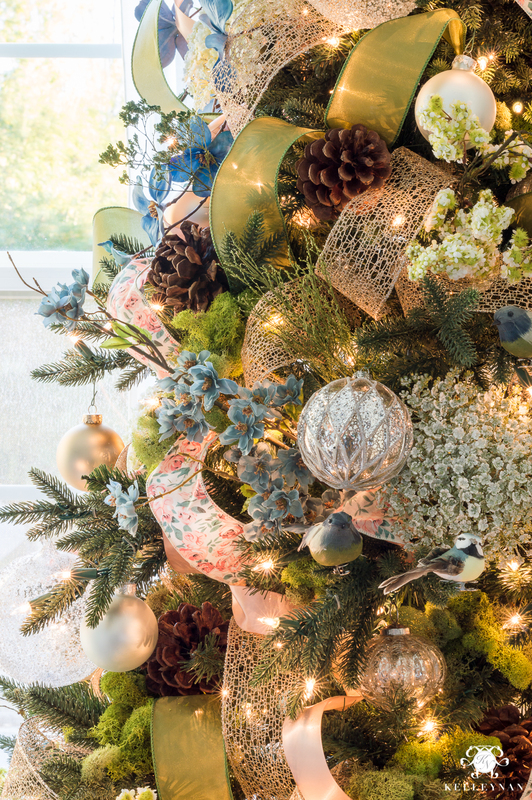 Manipulate the flower branches (don’t just leave them as a straight cluster). I spread most of mine out (the smaller blue blooms were scored as fall for .90/a stem. I usually let the picks/stems that are more “stem-y” stick out more from the tree. This helps give a more natural, organic, whimsical feel. I saved a couple of bigger blue floral stems for the top. 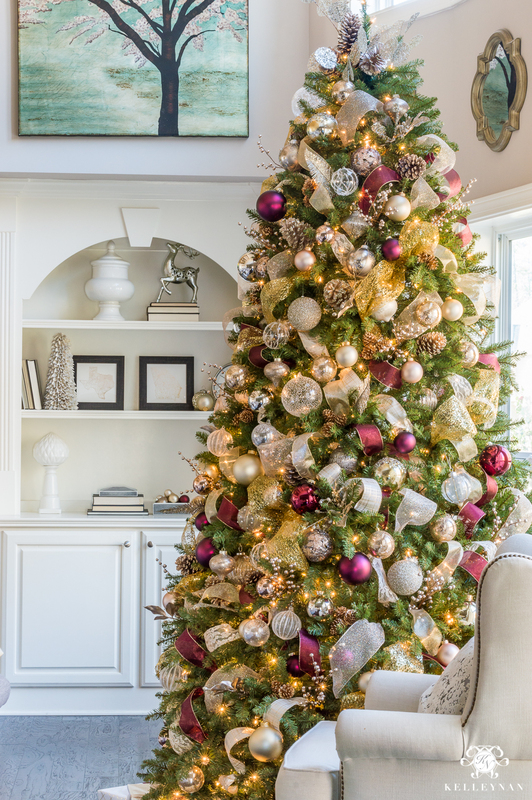 Instead of spreading them out evenly like the others, I concentrated them at the top of the tree and kind of came down from there at a wrapping diagonal to create that focal statement. You can also create something similar with a series of picks, branches, or berries. See how full it’s looking? And we haven’t even added the actual ornaments! At this point, I went ahead and added the ornaments. No rhyme or reason, just random and all over. 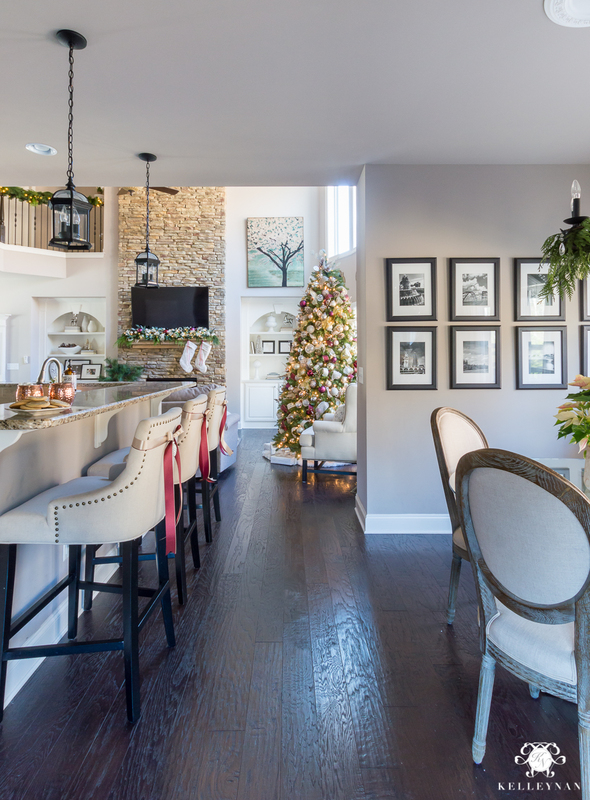 Again, if the ornaments are your biggest statement, you may not have huge floral stems and ornaments may immediately follow the ribbon portion. I nestle heavier ornaments inside on more sturdy limbs and lighter ornaments further out on smaller limbs. Some people only use big ornaments at the bottom and smaller on top but I like to mix all over. I also have more special, intricate ornaments that I mix with regular filler balls from Hobby Lobby/Michaels. After the bigger elements, and then ornaments, I add in smaller picks (in this case, dried stuff that I don’t really know what it is haha) to start hiding more of the ribbon security areas. I also wedged pinecones in, perfect for the meadow tree (or most any Christmas tree 😉 ). 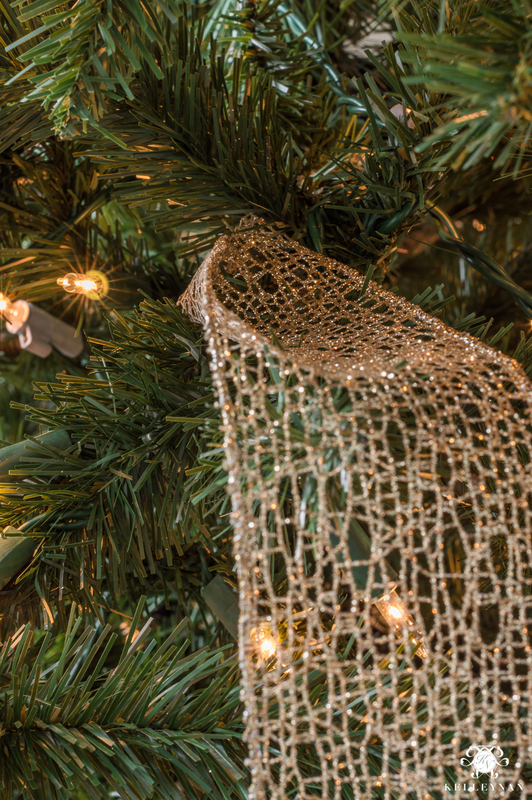 These were really easy to use- even easier than actual hanging ornaments. I also use ornaments to help cover those spots. See how everything is disguising the ribbon tucks? Friends, I hope this helps. If you use any of this process, especially in applying the Christmas tree ribbon, I want to know! Shoot me an email to share – I would absolutely LOVE it. 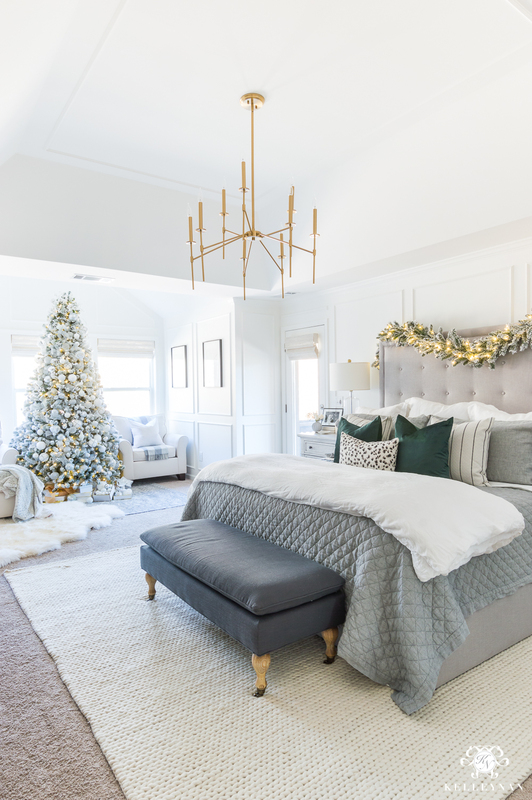 And one of my favorite spots during the holidays – our master bedroom. 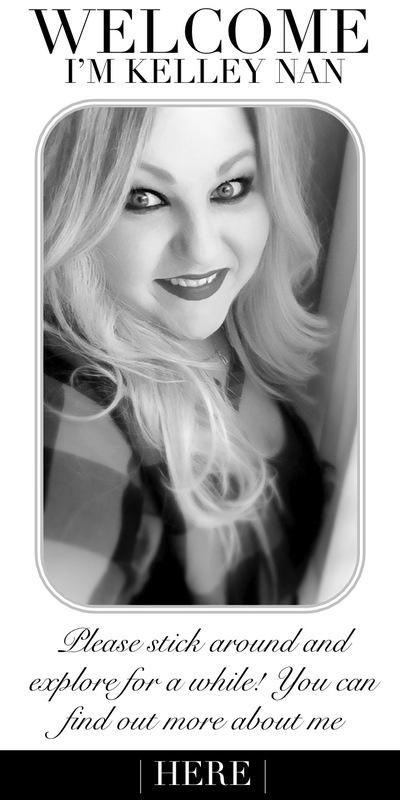 Lastly, if you aren’t already, subscribe to my emails below to see all the Christmas to come! Thank you Kelly!! GREAT tips, very helpful. I’ll send you my tree pic soon. Can’t wait to try this out! KELLEY NAN. OH KELLEY NAN. This has GOT to be the MOST beautiful tree I HAVE EVER SEEN. The blues, and especially the moss!!! Omg!! I looooove the moss! You’ll be seeing that on my tree next year! What a special gift you have shared for all in this tutorial. 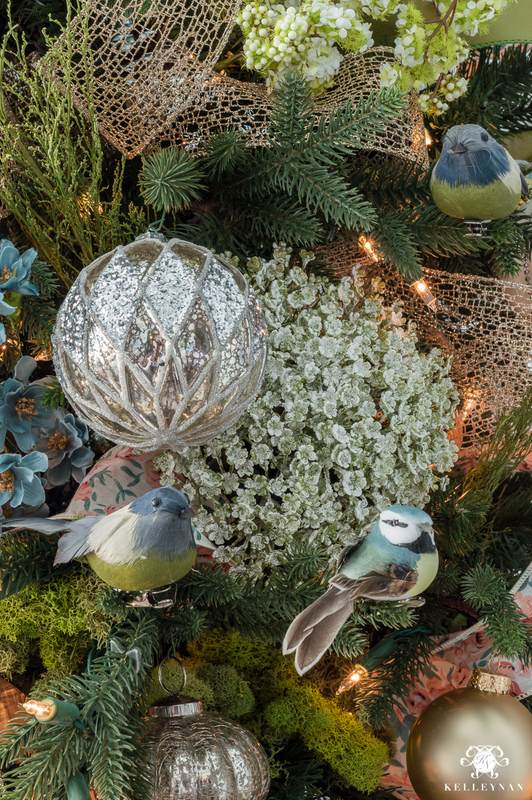 I love your meadow tree…especially the sweet little birds! Bravo! First tree I’ve seen this year that inspires me to do something different! Love it! Absolutely stunning – thank you for the ribbon tip. I struggle using the entire roll of ribbon going around and tucking. Thanks for the tutorial! My husband loves the birds too in our tree; it’s his favorite thing! Your tree is stunning! Thanks for the tips! We need a Youtube video of you doing this!!! Can’t wait to do some of these tips! Thank you for sharing your priceless tips and inspiration. 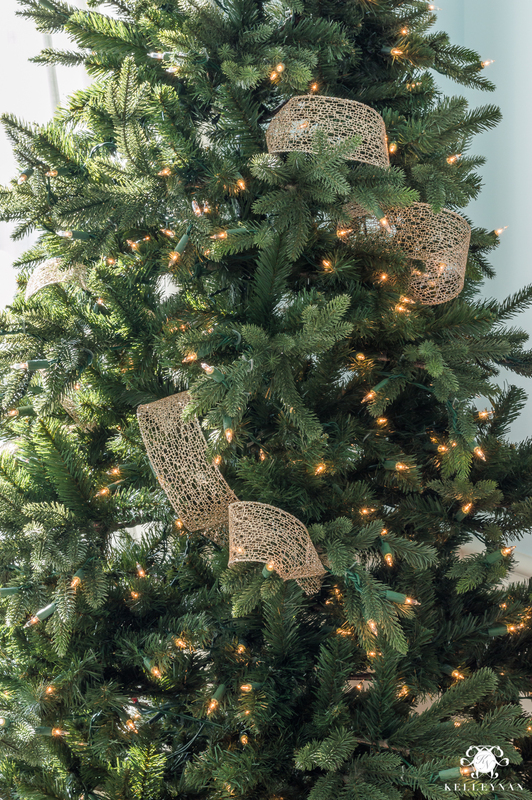 For years I’ve wanted to use ribbon for my tree, but had not idea where to begin. I can’t wait to start decorating this year. I’ll definitely email you pictures! This is gorgeous! Thank you for the tutorial but I don’t think mine will look as nice as yours. Maybe, with practice. I add birds, baby’s breath and pine cones to mine, as well. My balls are gold & red. I’ve never thought to add non traditional coloured ribbons. Time to change up my tree. This is a great tutorial and it’s a gorgeous tree. So gorgeous. Girl! you have the most awesome taste in home decorating. Thanks for the tree tutorial and sharing your ideas with us. This is beautiful as well as a time saver for me. I plan on silver and chocolate with Tiffany blue color scheme decorations this year. Please keep up the good work! Have a Blessed Thanksgiving. Gorgeous as always!!! I’m excited to put up my tree this year! We move into our new house in the 15th of December! Love your master bedroom too!! Beautiful! Could you share where you got the blue and green birds? Wow, this X-mas Tree is stunning. I also appreciate all your tips and suggestions. Hi, Tamara! It was actually a HomeGoods find- it was recent so they may still have it! Kelly, great tutorial, I am going to try your ribbon application. Haven’t got my tree up yet but you have given me lots of ideas. Can’t wait to start. What a great and comprehensive tutorial, thanks Kellynan. I always put ribbon on last, but end up rearranging ornaments after the fact to accommodate the ribbon. Will definitely try it first next time, great tips! My tree ribbon turned out perfect this year! I normally either swirl it around the tree, or cascade it down. Making these little random loops is a much better method! I only used one ribbon (I was at a remote location and didn’t have a second one), but it still looks fantastic! Thank you so much! Stephanie, I am so glad!! Merry Christmas! I can’t wait to use your tutorial to do our tree this year. Thank you! Thank you for sharing! 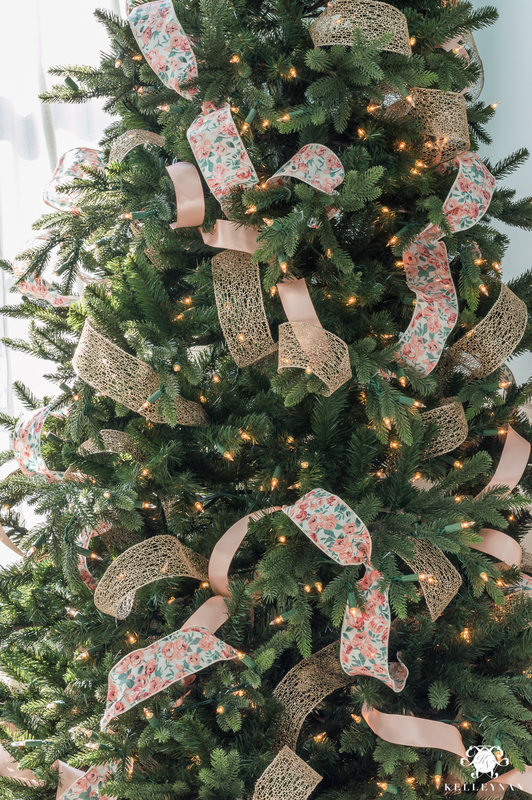 I keep seeing ribboned trees, love the look, but didn’t know where to begin. Your post breaks it all down into easy steps! Beautiful tree! Lauren, I am so so glad! I hope it is helpful! I was specifically looking for something to better guide me in ribbon “garlanding” this year as my attempts in the past never quite hit the mark of what I envisioned in my head. Then I came across this tutorial of yours Kelley and I got quite excited …. it was EXACTLY what I had been looking for in terms of inspiration! And I subscribe to the same theory of “more is more” too so two for two right there! I will most definitely send you pics of the finished product and thank you for the tips! Thanks SO much for this post. I followed it and successfully completed by first Christmas tree with ribbon. I mentioned you and your post on my recent Christmas tree/tour blog post. Have a look! Can you tell me where you bought your tree? Its beautiful! Wow…..I’m speechless!! And that doesn’t happen often!! 🙂 The 3′ length thing vs. keeping the ribbon whole…….such a great tip!! Thank you for this great tutorial on how you make your trees so incredible! My question is, how many of a particular item-a certain style and color of ornament, large flowers, etc. to use. If you find only 3 great ornaments that support your theme, is that enough, or should you keep looking for something else that you can find more of? Linda, I think it just depends. I definitely only have 3 of some ornaments but they coordinate with others. Nice decorating Christmas tree. I like your decorating idea. You share info is really useful. Great blog. Thanks! Thank you so much for this tutorial, I will send you a pic when I have done our tree as you have totally inspired me. I believe that you could make a sack of spuds look fabulous and glamorous! Heather, I would LOVE THAT!! Here’s to a beautiful Christmas season! I loved this, I try and do some thing different every year with my tree, my nieces come and can’t wait to see each years tree. 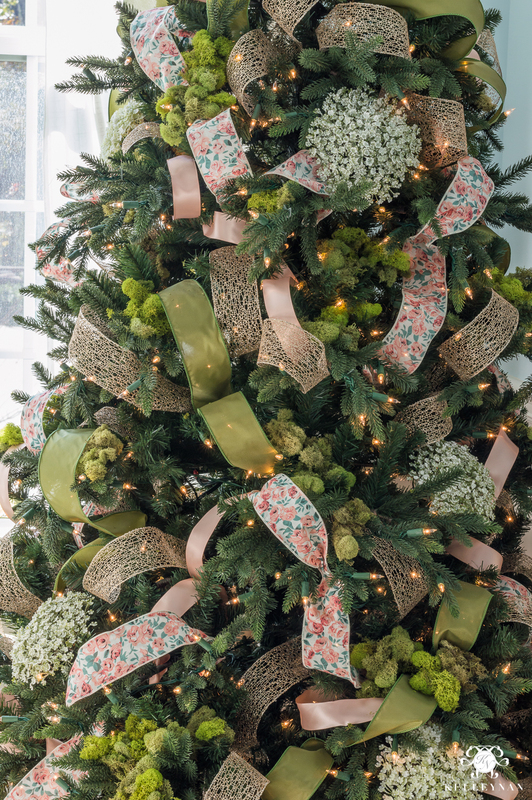 This year iam going to use your method and do a ribbon and flower tree. Thank you so much for the inspiration. After 30 years of trees this one is my favorite. It’s fabulous. Ty for the ribbon idea! Hi! 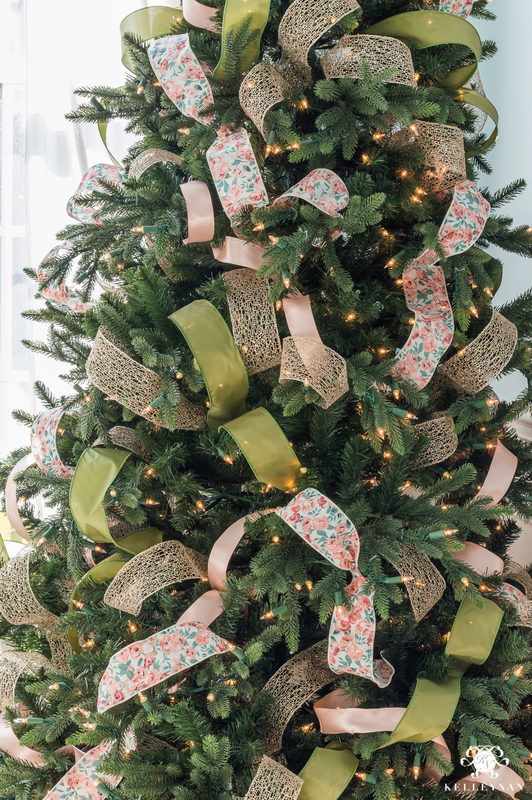 I stumbled you your blog after looking for a tutorial on how to add ribbon to my tree. 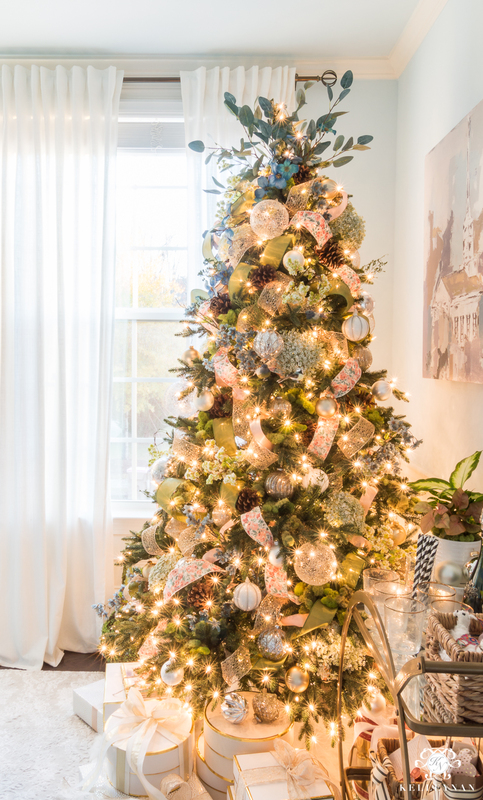 Your instructions were so helpful, not just regarding the ribbon placement but also adding ornaments and statement pieces. 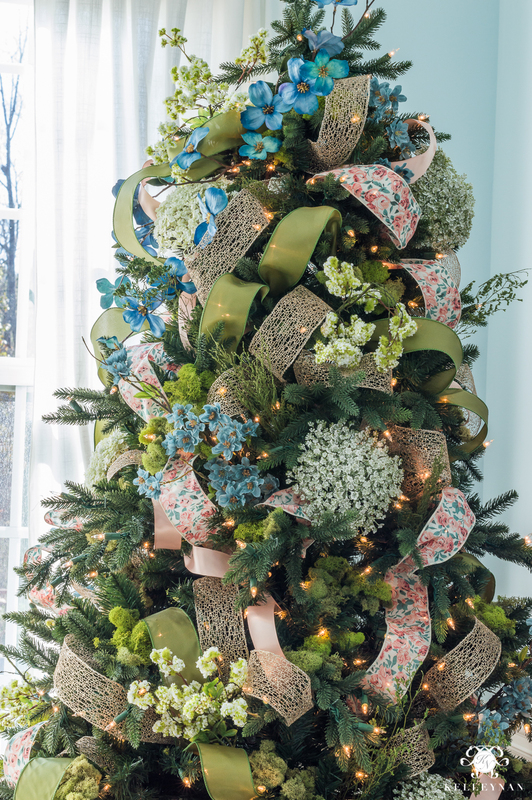 I don’t really like traditional red and green, so your floral tree with greens and blues were just my style! I used it for inspiration for my tree this year and it’s the first time I’ve been pleased/excited with the final product 🙂 Wish I could send you a pic because I love it so much. Thanks again!